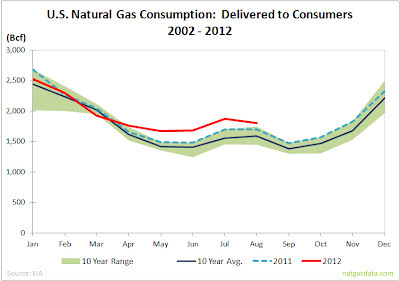 This week, the EIA released its monthly energy reports showing the production and consumption of natural gas through the month of August 2012. Production continued at a pace well above average. 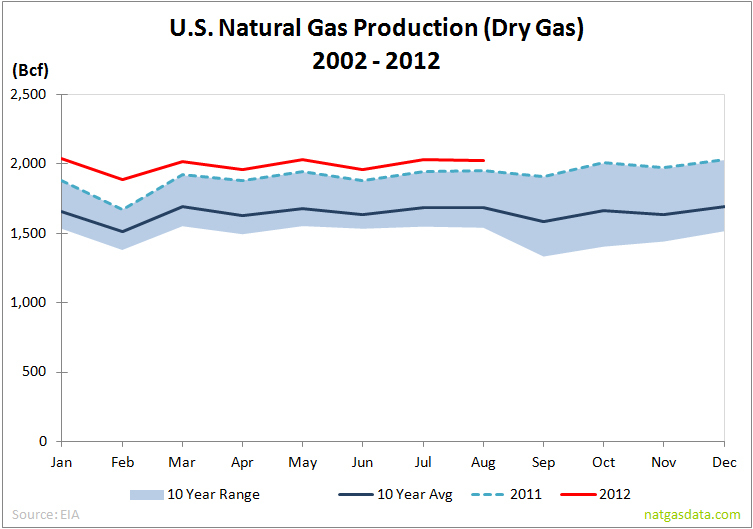 Cumulative dry gas production for the first eight months of 2012 was 15.96 Tcf, which is 21.1% (+2.8 Tcf) above the ten year average and 5.8% (+877 Bcf) above last year. 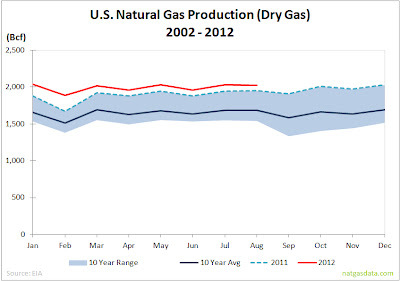 Monthly production was 2.023 Tcf, which was up 3.7% (+72 Bcf) from August 2011. To help offset the increased production, consumption through the first eight months of the year was also higher than average. Cumulative consumption through August was 15.547 Tcf, which was 8.7% (+1.25 Tcf) above the ten year average and 3.5% (+524 Bcf) above the same months in 2011. Total consumption in August of 1.804 Tcf was 13.1% above (+209 Bcf) the ten year average and 6.1% (+104 Bcf) above last year. Higher consumption continues to be driven by increased use of gas by utilities. 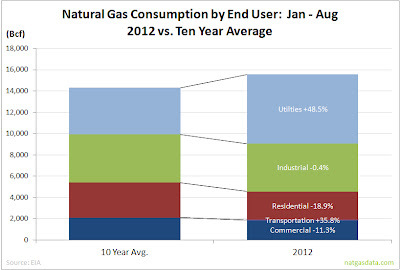 Compared to the ten year average, utilities increased natural gas consumption by 48.5%, while residential was down 18.9% and commercial was down 11.3%. Through August, utilities represented 41.8% of all gas consumed. 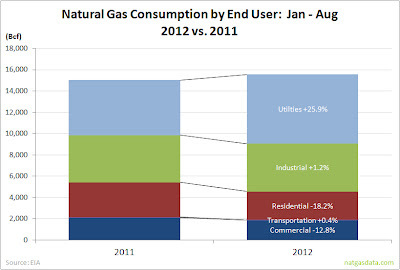 Compared to last year, gas use by utilities was up 25.9%, while residential was down 18.2% (warm winter killed residential use in 2012) and commercial was down 12.8%. Bottom line: production continues to run high even though rig count is at a 13 year low and consumption is driven by the utility sector, which is using gas because of its low price.